Whether you’re throwing a party or just feeling festive, making a few delicious recipes is the perfect way to get into the spooky Halloween spirit. Her Campus has compiled some of the best Halloween recipes on the Internet, from appetizer to dessert. Enjoy! Bake the mummies on a cookie sheet at 350º F for 15 to 18 minutes or until the breadstick wrapping is golden brown. Grate 1/4 tsp. zest from top of an orange. Slice 1/2-inch slice off top of oranges and carve out pulp; slice enough off the bottom of oranges so they won't roll. Slice pulp of four oranges into half-moons (1 1/2 cups); set aside. Juice rest of pulp (1/4 cup); set aside. Cut a jack-o'-lantern face on each orange. Whisk together reserved orange zest and juice with vinegar, maple syrup, mustard, lemon juice, ginger, pepper, and salt. Whisk oil in until combined. Toss greens and reserved orange pieces with 2 to 3 tbsp. dressing. Stuff orange shells with salad; top with pumpkin seeds. In a large bowl, combine the cornbread mix, milk, eggs and food coloring just until moistened. Pour into a greased 9-in. x 5-in. loaf pan. Bake at 400° for 30-35 minutes until a toothpick inserted near the center comes out clean. Cool for 10 minutes before removing from pan to a wire rack to cool completely. Cut top fourth off loaf of bread; carefully hollow out bottom, leaving a 1-in. shell (discard removed bread or save for another use). In a large skillet, saute peppers and onion in oil until tender. Set aside 1/4 cup pepper mixture. Stir chili into remaining pepper mixture; heat through. Spoon 2-1/2 to 3 cups chili mixture into bread coffin; arrange reserved pepper mixture over chili. Replace bread top. Transfer remaining chili to a serving bowl. Place cheese sauce in a heavy-duty resealable plastic bag; cut a small hole in a corner of bag. Write "RIP" with cheese sauce, then repeat with ketchup. Serve immediately. Spread sauce in an even layer over dough, leaving a 1-inch border around all sides. Bake until the underside of dough is golden (lift up pizza with a spatula and take a peek), about 15 minutes. Use a ghost-shaped cookie cutter to cut ghosts from cheese. Place ghosts on top of hot pizza and bake for 5 minutes. Place two capers on each piece of cheese for eyes. Let stand 5 minutes on a wire rack before slicing and serving. Place strawberries in punch bowl. Pour in 7-Up or Sprite. Pour in grenadine. Do not stir. The grenadine looks like blood! In punch bowl, large pitcher, or pitchers, combine apple cider, orange juice, and lemon juice. Slowly add sparkling white grape juice or sparkling wine. Serve immediately. Frost the cupcakes using the white icing. Insert the stick into the cream layer of the Oreos. Melt your chocolate according to the package directions. 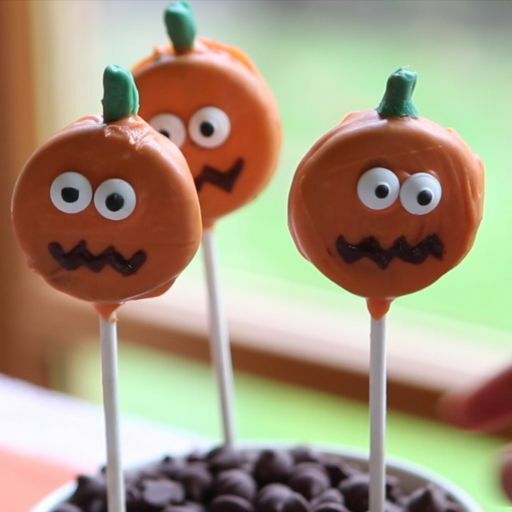 Coat each “Oreo on a stick” with chocolate (dark for bats and orange for the pumpkins). Let harden. While those are hardening, cut out bat wings. Lay the fruit leather out and cut the shape of bat wings. For the bats, once the chocolate is just about hard, push in sprinkles to the front. Use white sprinkles for the mouth and fangs and some large round sprinkles for the eyes. To affix the wings, just put a dab of melted chocolate on the back and stick it on. Let it harden, face down. For the pumpkins, once the orange coating is hard, put some melted chocolate in a baggie with the tip cut off (or a piping bag) and pipe on jack-‘o-lantern faces. Cut off the top of the orange. Put your filling inside. Put the top back on. Line a baking sheet with wax paper or parchment paper. Trim a small piece from one side of each strawberry so they can rest flat on wax paper. Insert 2 sliced almonds about 1 inch from pointed end of strawberry to make the ears on the rat. Repeat with remaining strawberries. Insert a fork into the wide end of a strawberry. Holding the strawberry on fork, spoon the melted chocolate over the fruit to coat, allowing any excess chocolate to drip off. Place on baking sheet. 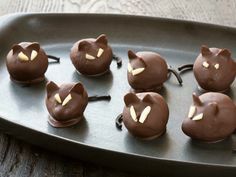 While chocolate is still wet, arrange 2 slivered almonds to create eyes, then place licorice pieces at the bottom of the wide end of the strawberry to form a tail. Repeat with remaining strawberries, chocolate, almonds and licorice. Chill until firm. 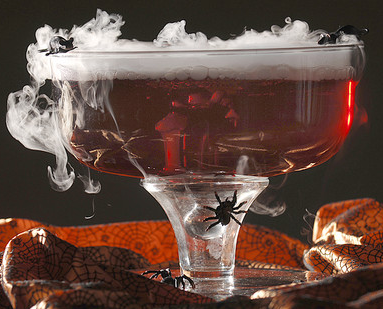 What recipes will you be making this Halloween, collegiettes?